Across the street from Pat's King of Steaks is its more ostentatious younger brother (rival). Geno's is taller, more showy and I bet, more flashy when it gets dark compared to Pat's decor across the street. 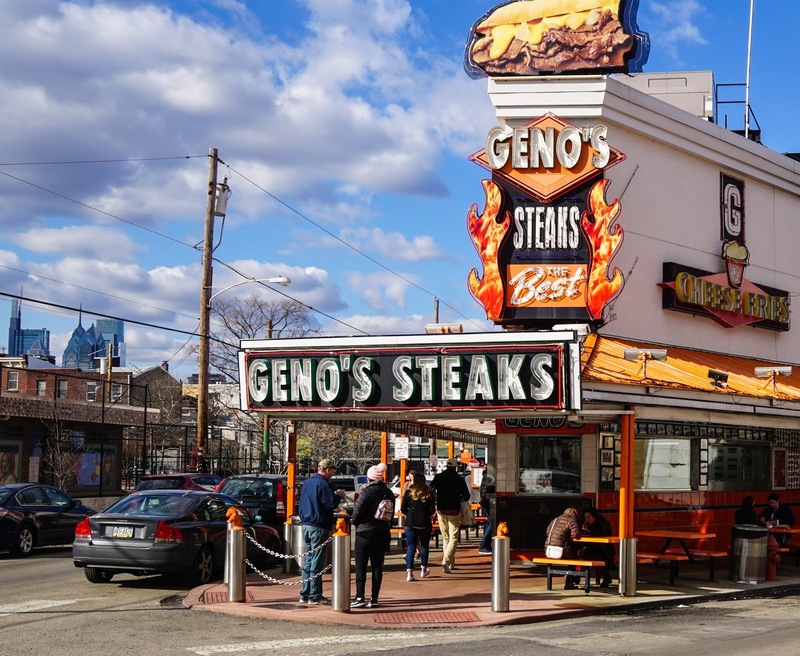 Geno is relatively a new comer circa 1966 compared to Pat's whose claim to fame is the invention of cheesesteak sandwich in 1930. Me ordering at Geno's, "One whiz wit, please!" What else do you do after you devoured the iconic Pat's and Geno's sandwiches? Well, I took bazillion more pictures with or without us in the pictures. We also took a little stroll at the edge of Italian Market that is just a block away from Pat's and Geno's. We discovered Cafe Crema past Geno's. We bought a couple of cannolis to go and used the bathroom as there are no bathrooms at either Pat's or Geno's. So back to Geno's cheesesteaks. What is the verdict? It was better than Pat's in terms of the moistness and flavor of the beef. The meat was skimpy as you can see in the pictures. We still think that Sonny's Famous Cheeseteaks was the best. Here is my post on our visit to Pat's King of Steaks. You decide.